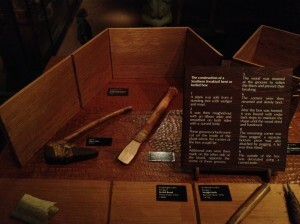 This weekend the family indulged in a quick get-a-way to Victoria, BC for a quick vacation. It’s only a few hours ride on the Victoria Clipper, and was nice and relaxing for us to get away from work and the messy house. 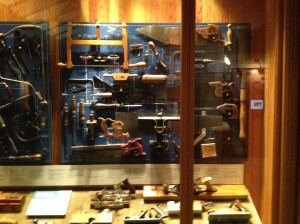 While we were traipsing around the Royal British Columbia Museum I ran across a few woodworking related displays and interesting tools I thought I would share. Overall the Museum is a fun trip, especially with kids, as the displays are really well done and not at all boring. 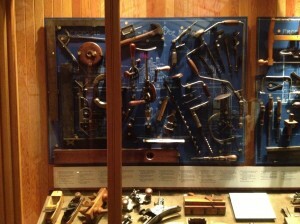 In one of the “through the periods of history” sections they have this great display of hand tools on the wall that any woodworker would love to have. 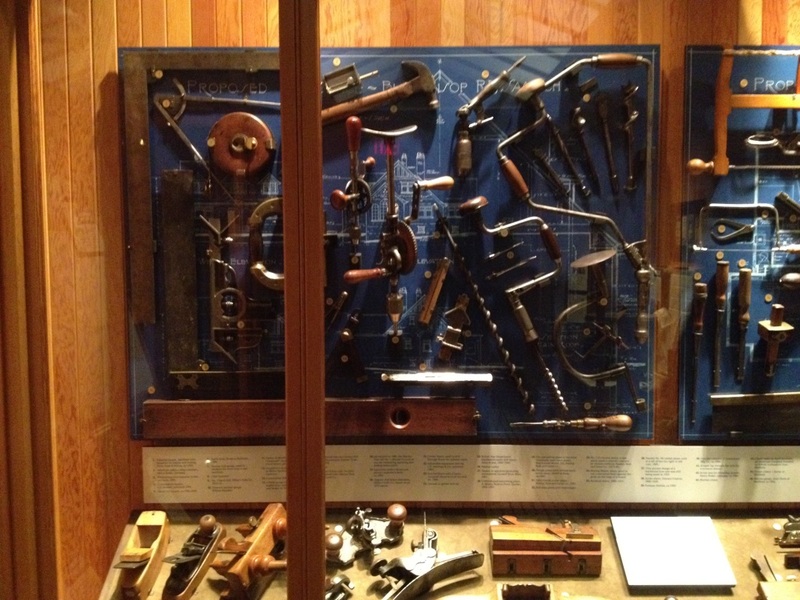 Some were more modern, but some were nice looking vintage pieces that would great additions to the toolbox. 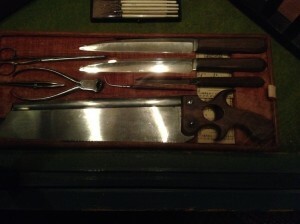 Further down the display they had an interesting saw in a kit for a surgeon. 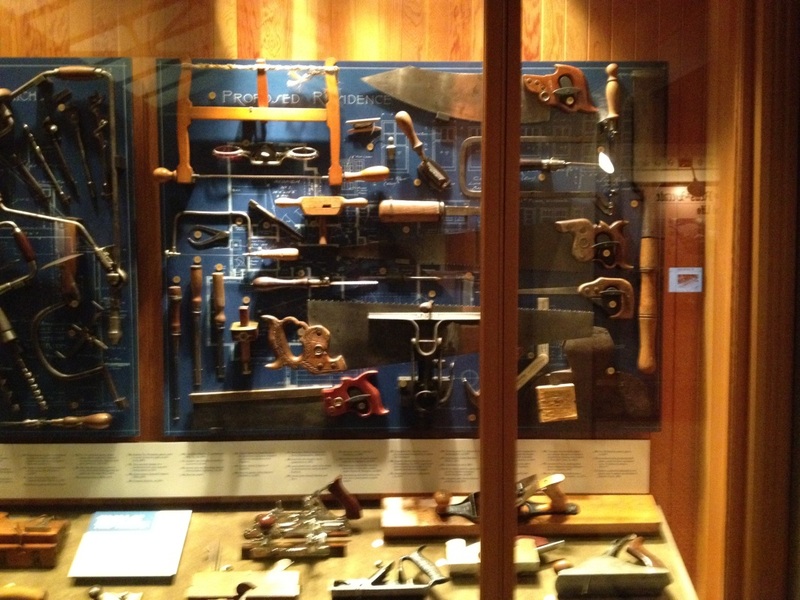 I snapped a picture because it looked like it would make a great handle design for a dovetail saw. The over in the native peoples exhibit they had a nice display on how they made the bentwood and carved boxes out of Cedar. 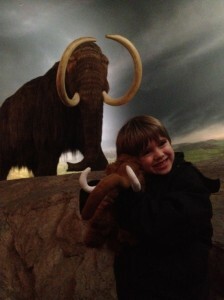 We had a great time, and my son loved the undersea area which is done in a very steampunk, 20,000 leagues under the sea theme that is superb, and the giant Mammoth display. He ended up with a stuffed Mammoth to take home which he was quite happy with. Oh man! First, if you ever take the clipper again, make sure you at least look up and wave to the offices just above the check in area. That’s where I work. Or send me a note and I’ll come down to say hi! I didn’t wave today, but I walk by there pretty often. I work just down the way on Elliot, and my morning walk from downtown often takes me right past your building! We should do lunch or coffee sometime! That box is quite interesting. 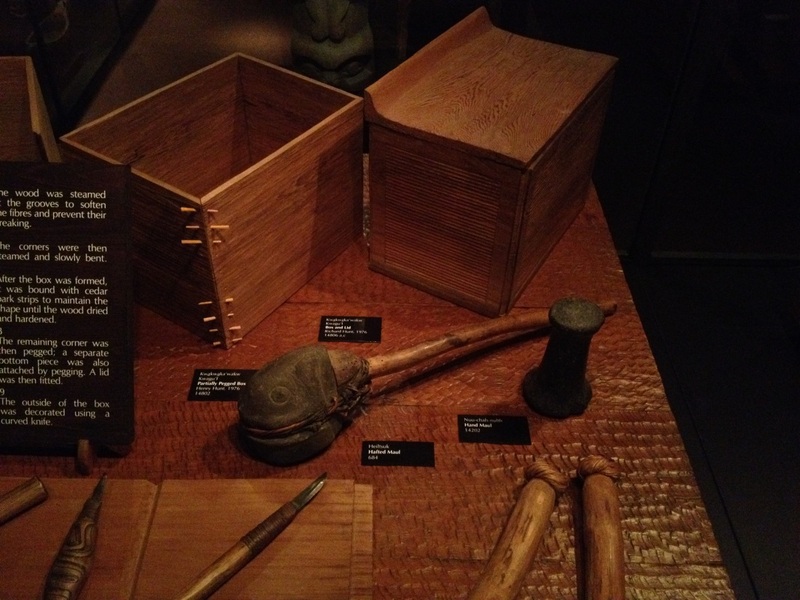 The Detroit Institute of Art has an exhibit on Northwest Indians and includes a box made by one of the tribes that is “sewn” together using strips of leather. It is sewn on all four corners. The bottom is made by using two “u shapes” at ninety degrees, so that there is a double layer bottom when the four corners are sewn.